@Joel When I open door 1 it unlocks 3 quests and says door 1 last 14 days. Does this mean those quests last 14 days OR until they are completed? @RandomUser Thanks. Kacey mentioned above that you had to start a holiday tower so I'm uncertain as to what that actually means? Regardless, I'm sitting here wanting to play but have no idea what is actually going on. I'm staring at the in-game event screens and forums hoping it all eventually makes sense. So I find this all very confusing, mind you I haven't had a chance to sign in yet and I was honestly hoping after the rush rush to collect as much candy corn as possible to have a day or two to relax and not worry overly about the game. So except for the first gold key for free what does each one cost? You got the Tower quest wreaths. If you would have used a key, you would have gotten wreaths from the Tower itself. At least that's what I believe at this point. @Joel will the festivus doors close if we dont use a key on them? just want to make sure because i wont have much time this week to get wreaths for keys. Free gold key? Sign me up, but where?! I just got a silver and a bronce one just a moment ago! I'm in the same boat. Basically I dont know whether to move forward or stand still. Do I need to unlock the first door to get quests and for the tower to work? If I don't unlock the first door because I need to "choose wisely" (seems more like "guess wildly") am I stuck? If I just go ahead and open the door without a gold key do I lose my chance at a six star blue ogre? So confuzzled! Help! There are several ways to earn wreaths, such as PvP and PvE. Besides that, you can open a door on the calendar every day at 3pm CST. Opening this door will give you some quests that last for a certain amount of time. With these quests you can earn more wreaths. Don't feel the need to hurry now, you can wait a few days to open the first door (or wherever you are at the moment) if you're busy. The quests will still become available when you open that door later. I hope this clarifies things a bit, if not, please ask. My Hero Progress and Evo tracking spreadsheet. That's one of the most confusing parts. 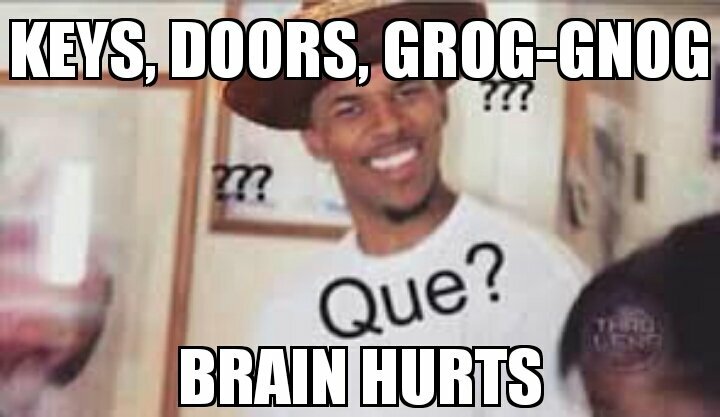 I am afraid to unlock the first door because I feel like I am going to lock myself out of a six star Grog-Gnog. @Joveth How long do the quests last once you open a door? Thanks. So some people got a banner that shows Door 1's tower quest and says "complete today's activities for great rewards." I don't have that banner. It would be nice if you clarified this because a lot of people missed out on potential rewards. Also, my post wasn't acknowledged but the posts below mine were. Is this intentional? Is anyone discussing why some players have begun the event with thousands of wreaths in their inventory? Here's the question at hand: Are people using the free silver key to unlock the first door? Each Day of Winterfest comes with a new Door that can be Unlocked using a bronze, silver, or gold key - each with scaling rewards. That Door does NOT need to be opened the day its released (example: Day 1-3 doors could hypothetically all be opened on Day 4 as they do not expire at the start of a new Day). Once a door is opened, additional quests appear that last a certain amount of time (much like the Secret Goblin dungeons that must be completed within 2 hours of activating them). Do you need to unlock at least one door for the new villain to appear at the top of the tower? Will the Winterfest doors be available immediately when a new day comes, or will it be like a normal event and occur around the event time? And unless you're willing to spend at least $100 to $150, you don't need to worry about 6 starring the new character, that's not happening. Ok, I unlocked the first door with a silver key (I don't have extra $$$ this month for the gold keys...) and it added more tower quests and some use friends quests - great! But, now do I have some tower quests that go away in 24 hours and some that don't? I think it would be great if the quest name included some indicator as to whether it was daily..that would be a big help. Once a door is opened, additional quests appear that last for 24 hours from the time you unlocked the door (much like the Secret Goblin dungeons that must be completed within 2 hours of activating them). I am still confused that if we open doors 1-3 on Day 4 if we get all quests that we would receive if we opened one door each day. Did I miss this answer? If Day 1 quest is to complete the tower. And Day 2 also has this quest.... can we complete the tower on Day 4 and get rewards for completing the tower for Day 1 and Day 2? That means that any quests you got from unlocking door 1 will last for 14 days or until they are completed. There are no "daily" quests in Winterfest. All doors should say how long quests last before you open them, and if you need to be reminded about a timer, just check you Events screen. That will tell you exactly how long quests for that day's door will last. REMEMBER: We have handy FAQ on the first page of this thread. There's a lot of info there. We know there's a lot of stuff going on and are trying to make things as understandable as possible. Sorry, lots of questions flying around, didn't mean to ignore yours. You say you're missing the event banner? Have you opened the first door yet? If you didn't get the holiday tower today, you'll be able to get credit for the quest from tomorrow's tower.